The Lower Raritan Watershed, New Jersey’s Watershed Management Area 9 (WMA9), is home to 846,446 residents (2017). At 352 square miles, the Lower Raritan Watershed/WMA9 includes the Watchung Mountains to the Northwest, the coastal plain to the Southeast and the lowest point of the watershed at Perth Amboy and the Raritan Bay. The northwestern section of the watershed lies within the Piedmont province while the south eastern portion of the watershed lies within the Inner Coastal Plain province. 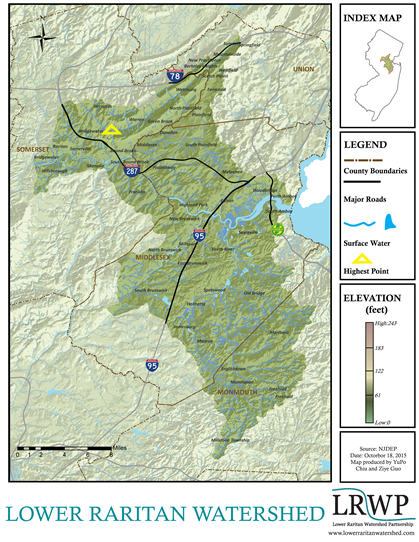 Do you live in the Lower Raritan Watershed? Check out our interactive map to find out! WMA9 is itself made up of six major watersheds, including the Lawrence Brook to the southwest of New Brunswick, and three watersheds along the Raritan, from the convergence of the North and South Branch in the northwest, down to the Lower Raritan, below Lawrence extending to the east and to the Raritan Bay. Read more….